Hey party peeps! 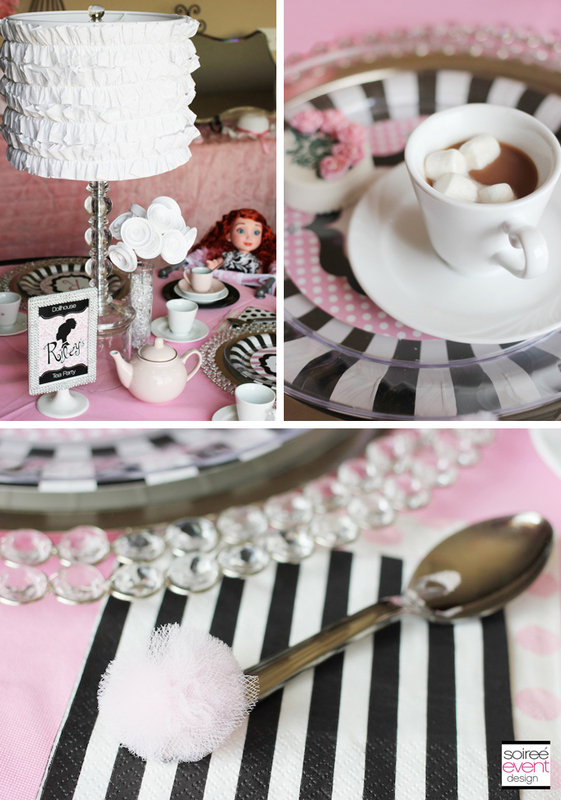 I’m putting my own spin on the traditional tea party today with my Dollhouse Tea Party theme! 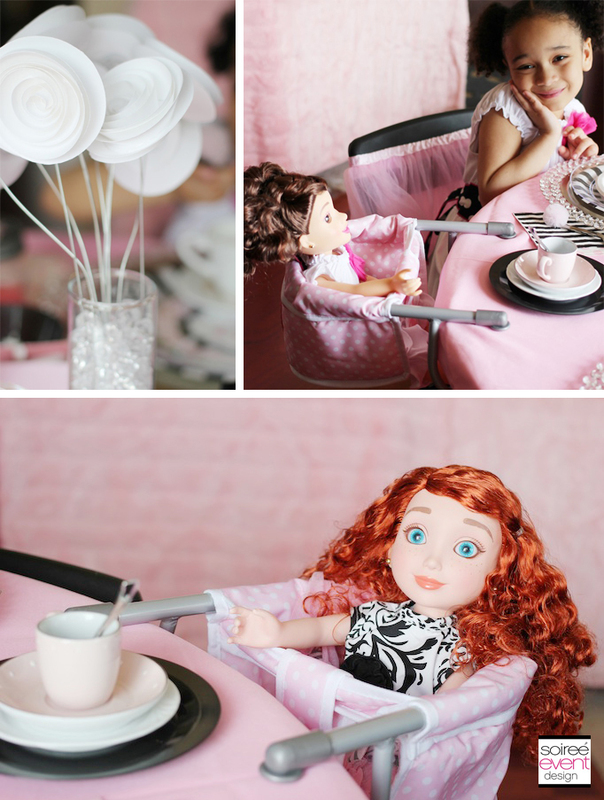 Tea parties have been around for a long time, but the new trend is to invite your friend’s to bring their favorite dolls to the party and have the girls and their dolls dress up in matching outfits for tea! 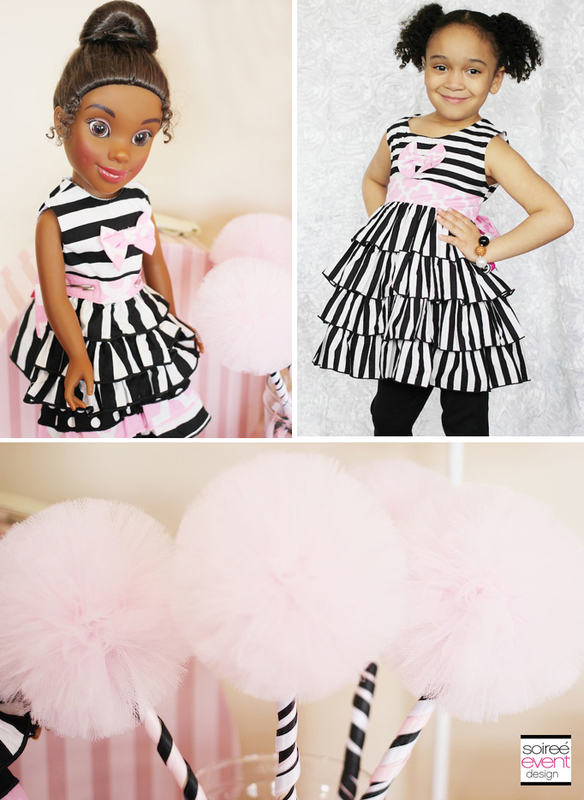 At the forefront of this trend is Ann Loren, a fashion designer who has an entire collection of gorgeous outfits for girls and matching outfits for their 18″ tall dolls. What a cute idea! 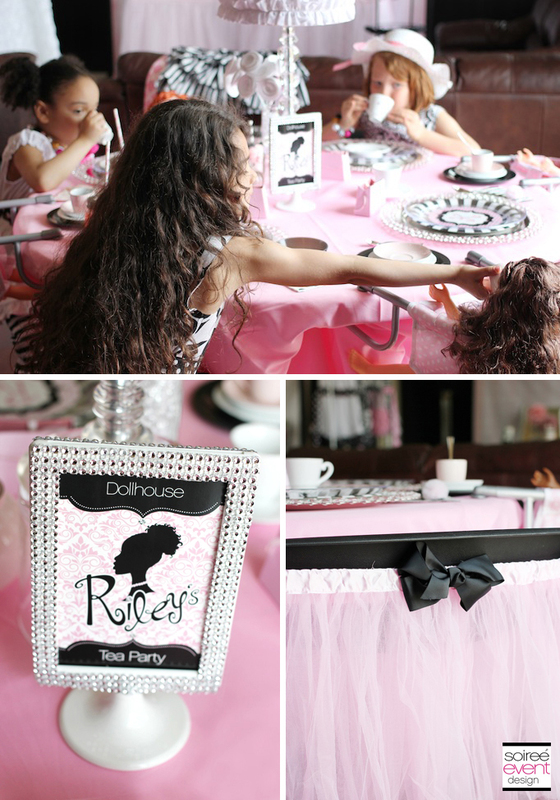 My daughter loves to dress up, so I hosted a Dollhouse themed tea party for her and some of her friends complete with a dress up bar, dessert table and photo shoot. They LOVED it! 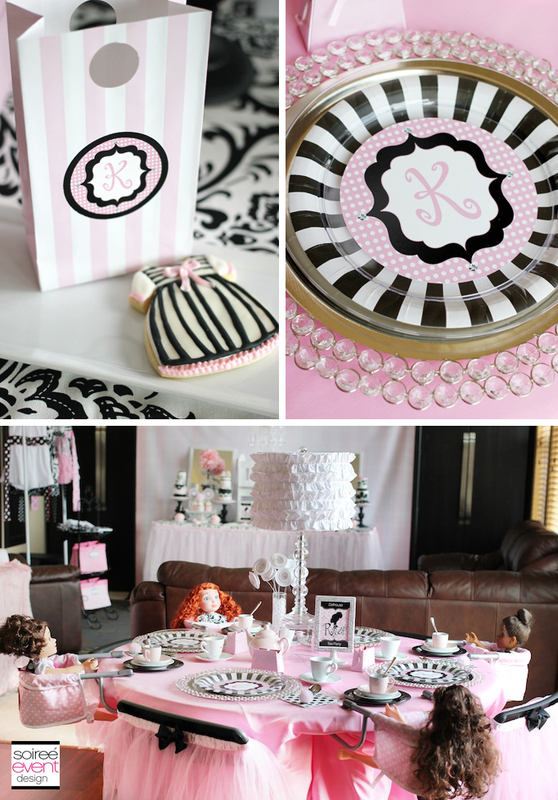 The inspiration for the entire party design were the fabulous outfits by Ann Loren that had an eclectic mix of patterns–polka dots, stripes, flowers and damask. 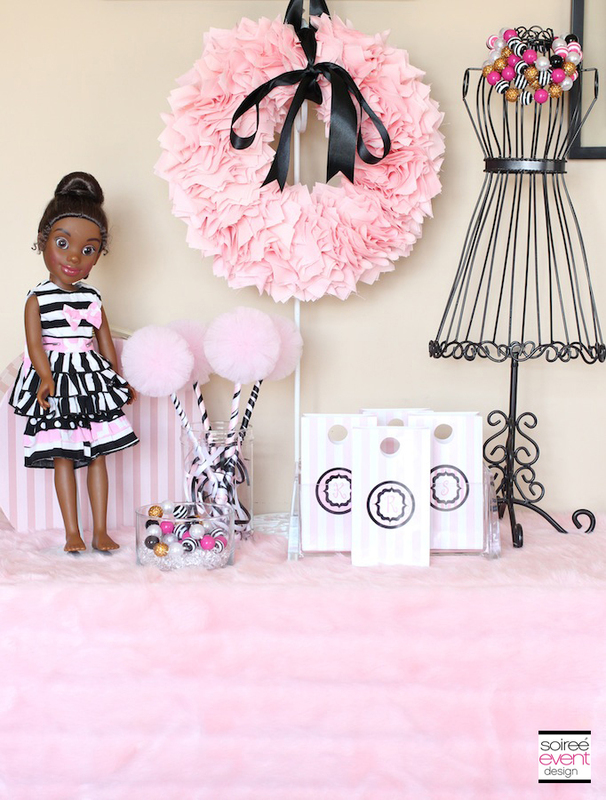 Using my own exclusive “Dollhouse” printable collection (now available in my shop) I wanted to create an upscale and girly dollhouse environment for the girls. Mixing a damask tablecloth with this gorgeous tulle table skirt by Candy Crush Events was the perfect base and when paired with the vintage pink and white striped vinyl backdrop from Bubblegum Backdrops I had the look I was going for. Adding in girly details was the fun part. The centerpiece was a doll-sized cradle with a crystal chandelier mobile from Koyal Wholesale flanked with these gorgeous fabric topiaries by Sweet Georgia Sweet! Girlfriend Tip: I lucked out and just borrowed my daughter’s doll furniture from her room for the centerpiece. I usually start in my kid’s rooms first for additional themed decor before I buy any. Usually I find plenty and I don’t have to spend any money. 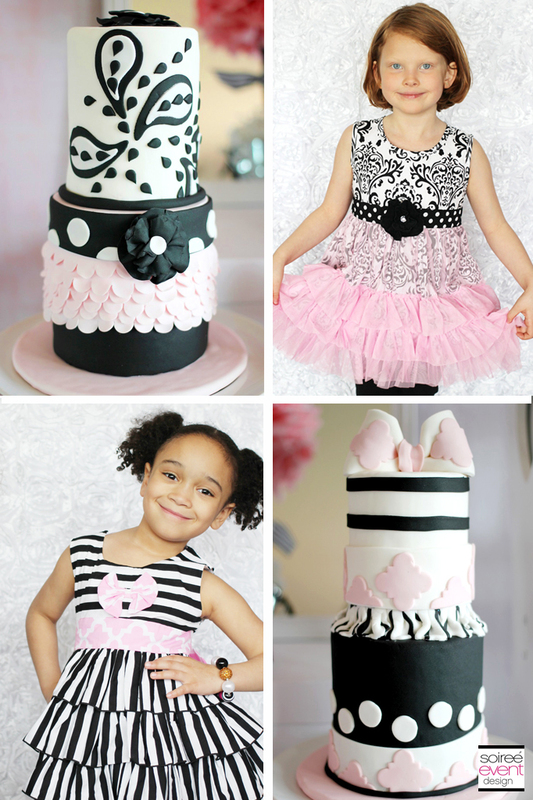 The desserts had to be just as girly and petite so I called on Fancy Cakes to custom design four mini cakes for each guest inspired by the four outfits that each girl would be wearing at the party. She nailed it! The girls were so excited to see these gorgeous cakes! 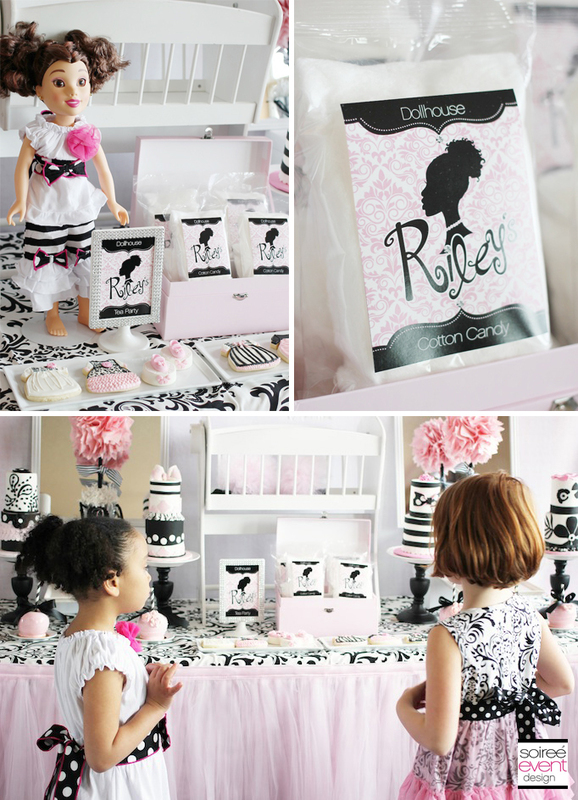 Roni’s Sugar Creations also custom designed desserts to match the outfits from custom iced cookies in the shape of little dresses to the gourmet apples and fondant topped chocolate covered oreos and cake pops. Rounding out the table full of goodies were custom labeled cotton candy bags (available here) that the girls each took home as a party favor. Girlfriend Tip: A small guest count of 4 for a tea party is the perfect time to have gourmet desserts since they tend to be pricier and since you only need 4 (one for each guest) is a little more affordable compared to a party of 12 guests. Tea parties are supposed to have a “fancy” look and feel to them, so says my daughter, so “fancy” desserts were what she got! 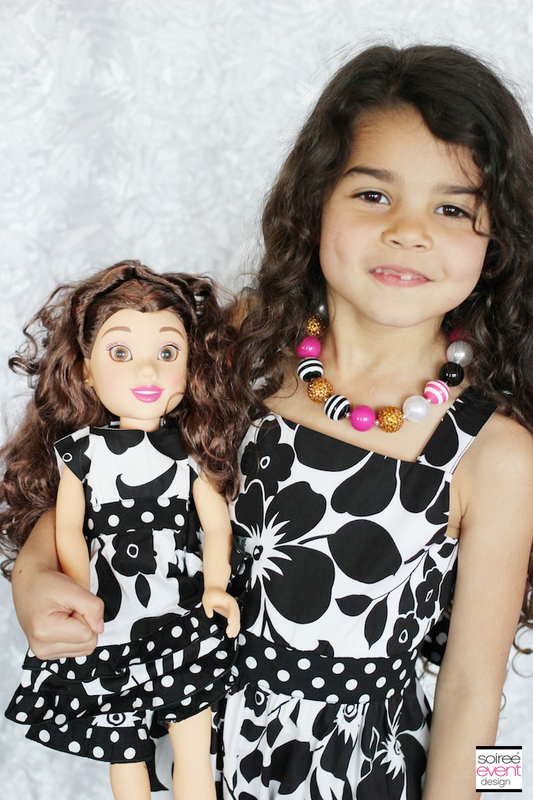 As the girls arrived they were each given an Ann Loren outfit to wear for themselves and one for their 18″ doll. 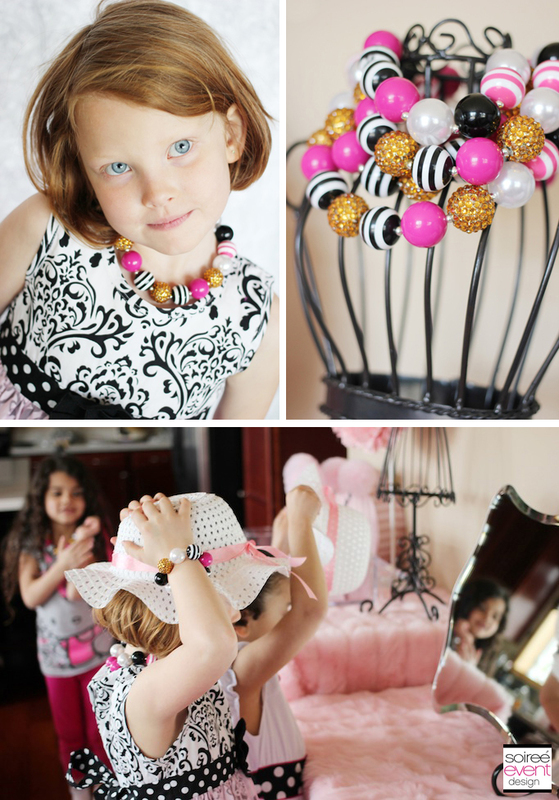 Once they were dressed they visited the Dress Up Bar to accessorize with these super cute chunky necklaces and matching bracelets from Lil Ms Sophia. 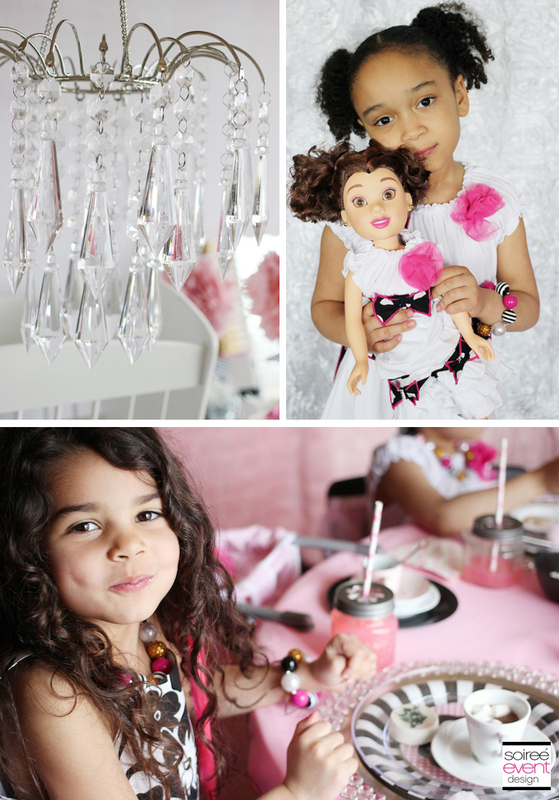 The girls all took home tulle wands from Titi’s Tutus and a white hat perfect for a tea party. 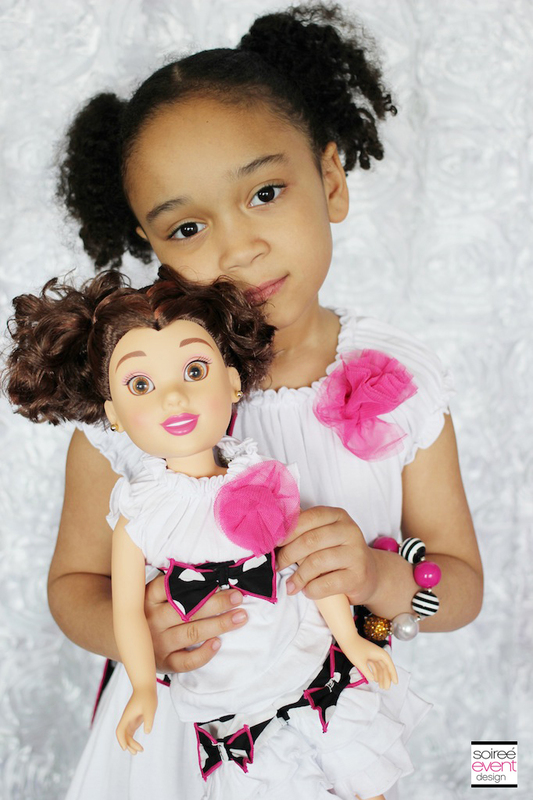 Once they were all dolled up, they posed for their very own Dollhouse Photo Shoot! Girlfriend Tip: Do the photo shoot before the girls eat to make sure you get great shots. Nothing worse than trying to take photos of your guess once they’ve eaten colored sweets and have colored teeth! LOL! 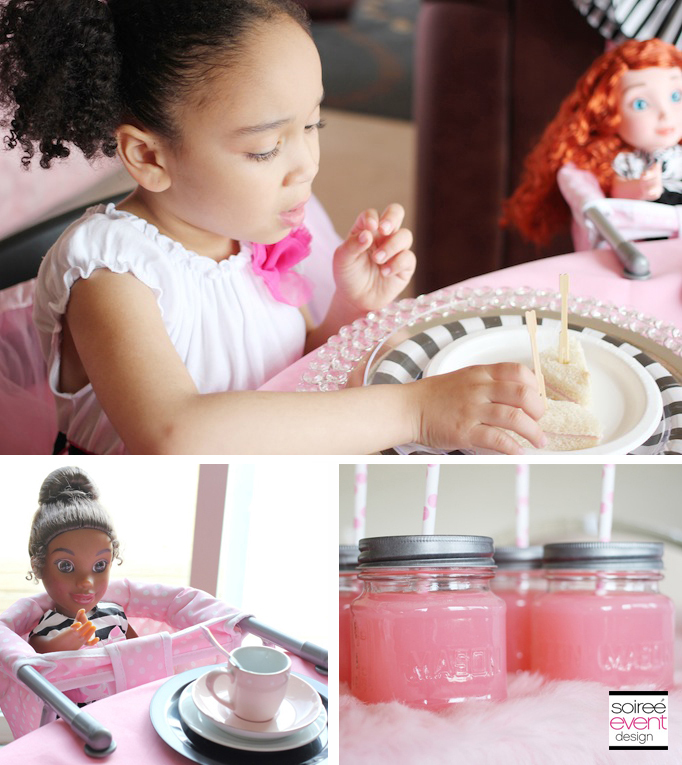 Once the photos were all taken, the girls took their dolls to the gorgeous tea party table and sat down with their dolls to enjoy lunch of petite sized sandwiches and pink lemonade. Next was tea (hot chocolate)! 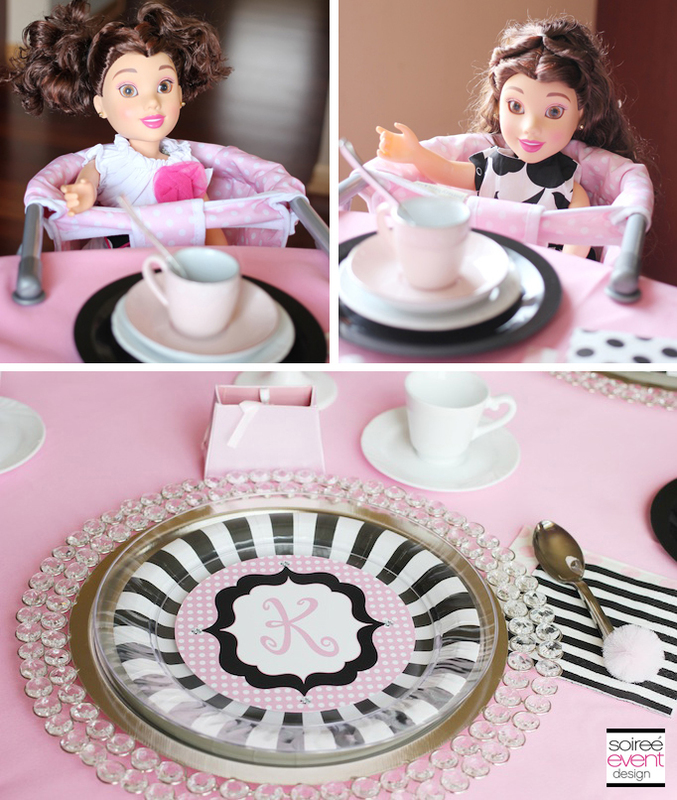 The girls loved being able to have their dolls sitting right next to them at the table with these clip on doll chairs. They also loved all the “fancy” sparkly elements of the table like the crystal chargers by Koyal Wholesale that were topped with striped paper plates by Hoopla Events with our Dollhouse printable plate inlay that I personalized with each guest’s first initial. The girls really loved finding their seats by finding their own special plates! Girlfriend Tip: Okay, okay, I have to admit…serving hot cocoa was the perfect alternative to serving tea. The girls loved it and Riley specifically did NOT want regular tea! I wanted to just serve pink lemonade from the tea pot, but Riley was NOT HAVING THAT! She said that it was a tea party so we had to have hot drinks. So, hot chocolate was the next best thing. The girls poured it from the tea pot and added Jet-Puffed mini marshmallows just like they would sugar cubes to tea. They really just wanted to go through the motions of serving tea anyway, so this turned out great AND marshmallows are one of Riley’s favorite snacks! Like what you see? You can now easily shop this look by clicking over to my Pinterest board for a virtual shopping list of most of the items I used in this party’s design along with prices and links to purchase them. 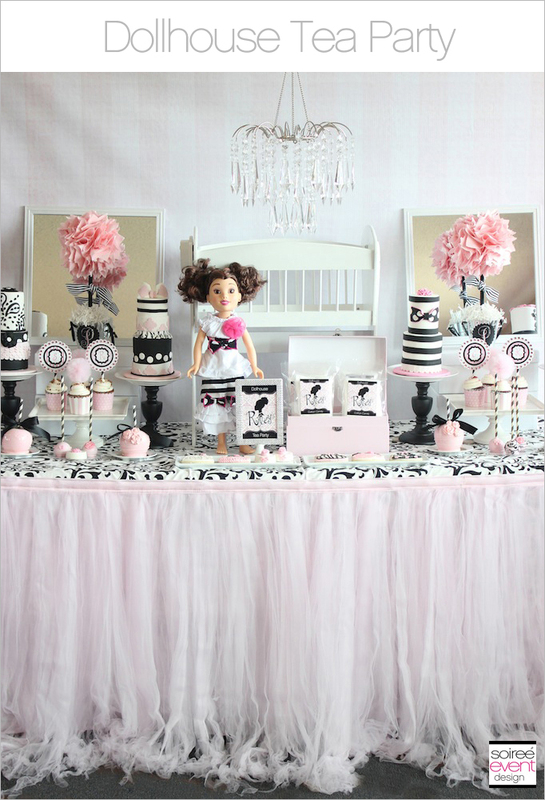 Follow Soiree Event Design’s board Dollhouse party on Pinterest. Love all of the black & white. So unique. Great job, Tonya! And so nice seeing you at SNAP!!! Thanks Gretchen! This one was so much fun to design! It was great meeting you too at SNAP! Goodness – how beautiful! I love it. Wow! Every detail in this party is amazing! 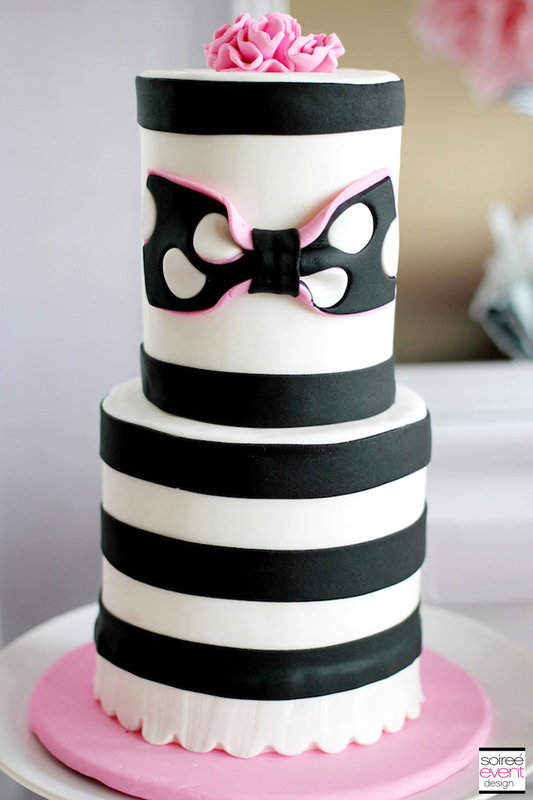 I love all of the details and the pink mixed with the black & white. I love how grownup it looks even though it’s a children’s party. Thanks Cheryl! The girls definitely felt grown up! They kept putting up their little pinkie fingers as they drank from their tea cups…it was so cute! Hey Kelsey!!! Thanks girlie! Miss you guys! My absolute most favorite color scheme. 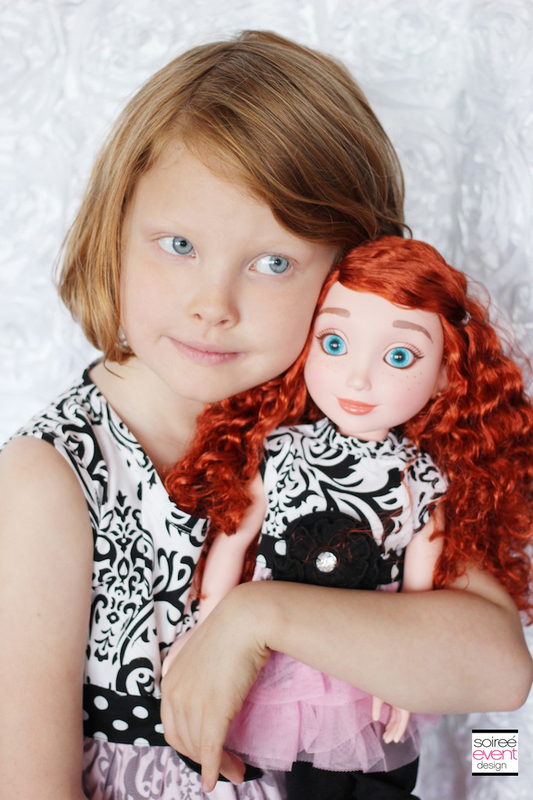 Those dolls are amazing! Thanks Jenny. I’m lovin’ this color palette too! 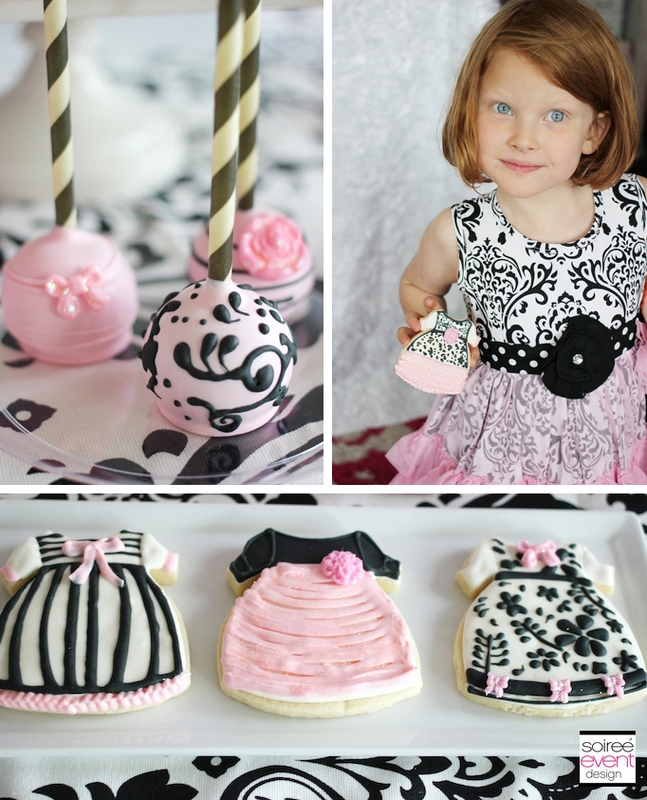 Absolutely love this adorable party! Thanks Deborah! It was so much fun to style! 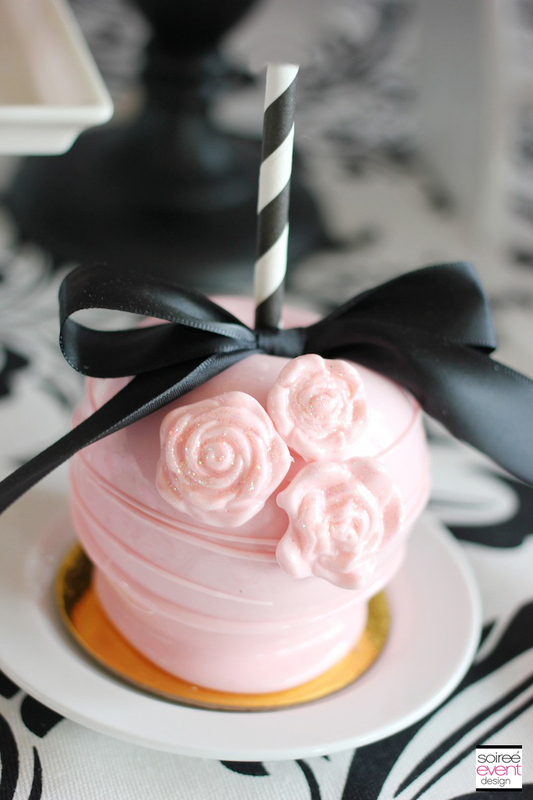 Everything is so pretty, pink and girl – and the black add a special bit of elegance! Another showstopper, Tonya!!!! Love this party Tonya. So many wonderful details that I can not just pick one favorite. 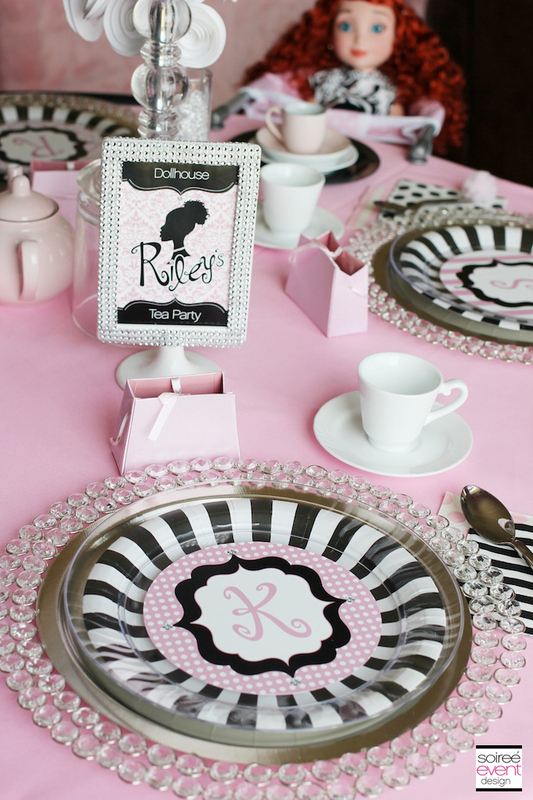 The printables are lovely, the tablescape LOVE, the bling and colors are just right!! Gorgeous. Those outfits were the perfect jumping off point! YOU ARE AMAZING!! every single detail is fabulous!! AWWW! Thanks Mindy! I loved your daughter’s Belle princess party too! 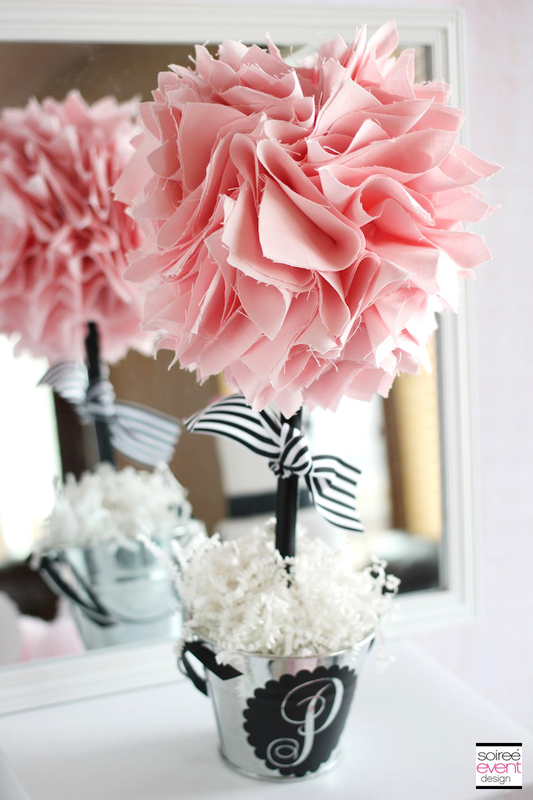 Love the mix of blush and black! That colorway will never go out of style. Stunning! Gorgeous! I have looked & looked & looked over the pics. Those mini cakes are incredible! 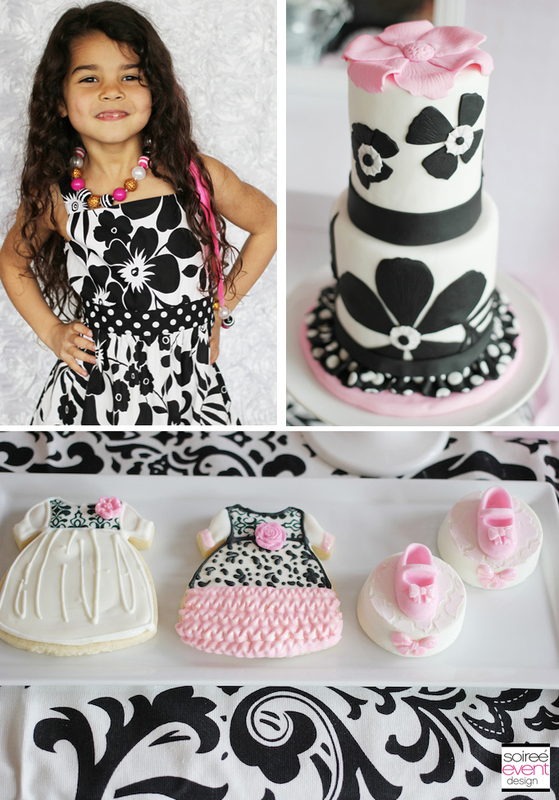 What lovely little fashionistas and such a darling party! So wonderful!!! I wish I had girls to have a party like this!!! Everything is adorable! Job well done! I love the idea of this. I think it’s perfect for little girls. Who wouldn’t love this. What abeautiful photographs that tell the experience, joy and fun of a party! I love the idea. What girl doesn’t like to dress up and have a party!! How fun! I wish I was that super crafty! 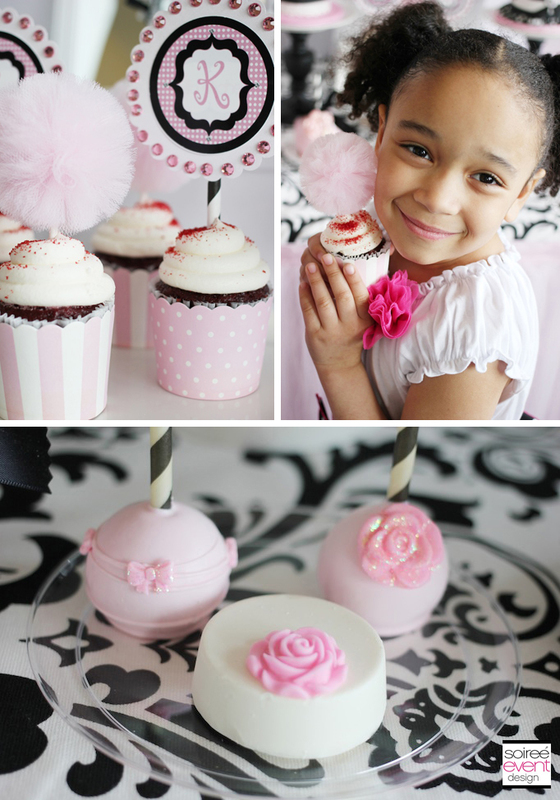 Oh, what a fun girly, girl party with my favorite colors! Everything is simply stunning! 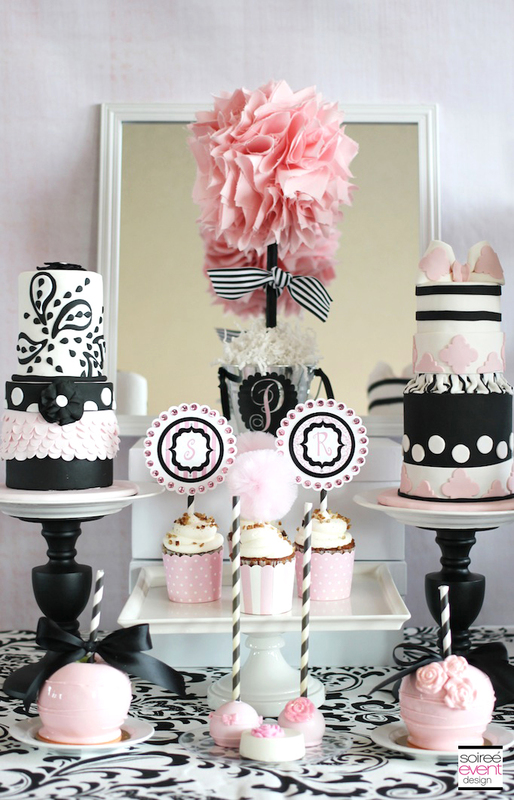 Love the black and pink! Lovely! This is one of my all time favorite color combos! Thanks! You have the most spectacular party setups! It’s just unbelievable! That is spectacular! I thought I planned out a great party for my daughter’s last birthday, but next to this it looks like I got fast food and a happy birthday sticker. LOL Melissa! I’m sure you did a fabulous job! Thanks Lisa! I so appreciate your kind words. 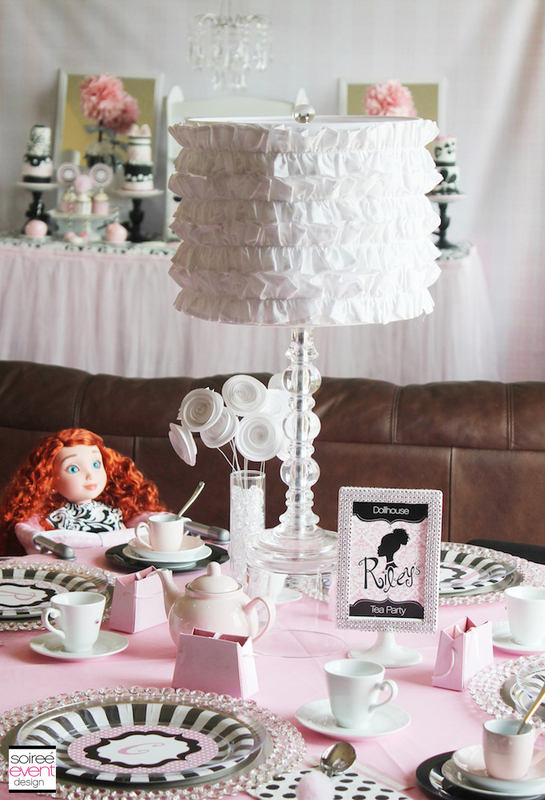 Oh my thats an amazing tea party. So stylish! 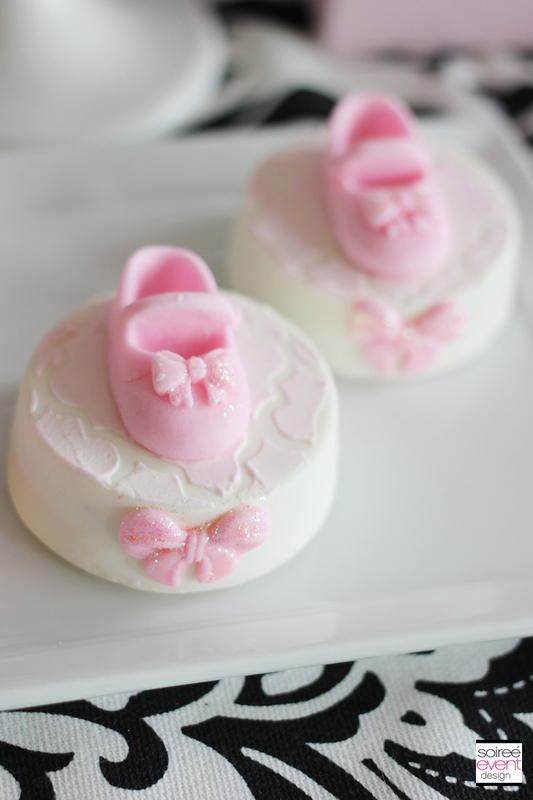 Any little girl would love this. I love the color scheme. Everything about this party is beautiful. Great job! Wow!!! I am blown away at your creativity and the beauty of this party!! You did a fantastic job-as always- and continue to leave us swooning over your work! You go girl!! Wow. I don’t even know what else to say but Wow. My girls would die if I ever made something like this for them. This is amazing! This is the coolest color scheme! The little area for the dolls is so cute! I love that table skirt. Those did turn out fancy. And gorgeous. You definitely have a knack. O.M.G for get my daughter, this is my dream party!!!!! Ummmmmm you need to come set this up for me!!! Incredible!! What a lovely party. I enjoy a nice cup of tea. this is a little girls dream!! My girls would absolutely love this! Everything looked perfect! This looks like it was a fantastic party. I love the black and white color theme. The dolls are so cute. This is lovely! My daughter would really enjoy a party like this, maybe I will surprise her next year. Love the pictures. This looks like so much fun!! I wish this was around when I was a little girl. I love the theme. Absolutely beautiful. Those aso beautiful, the girls are feeling it. 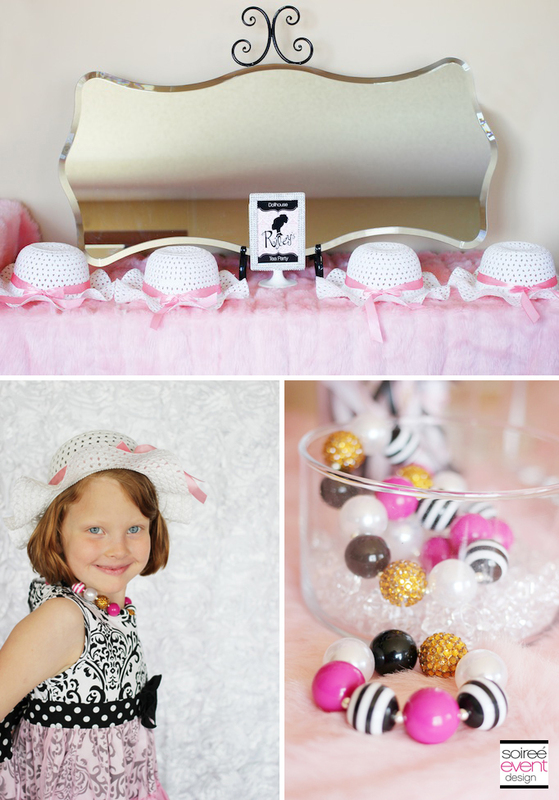 You did an amazing job preparing for this fun party for them,. Those details are just too beautiful! 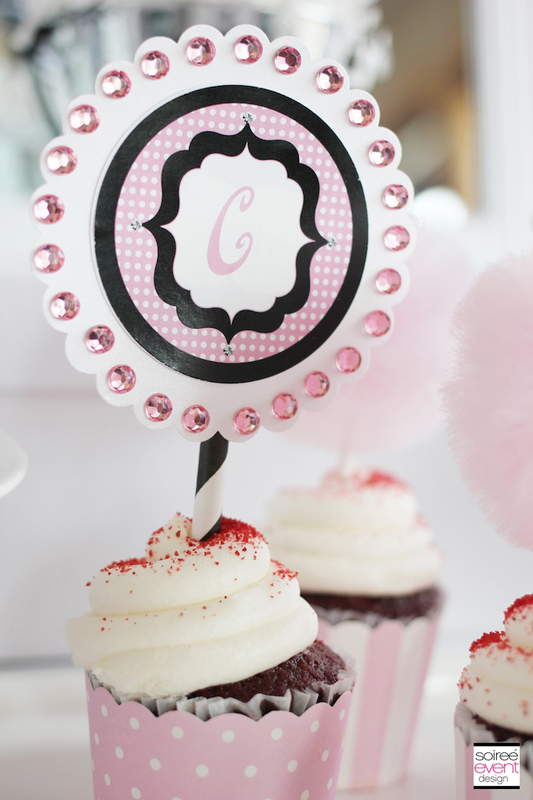 I am loving that pink decor and desserts. YUM! 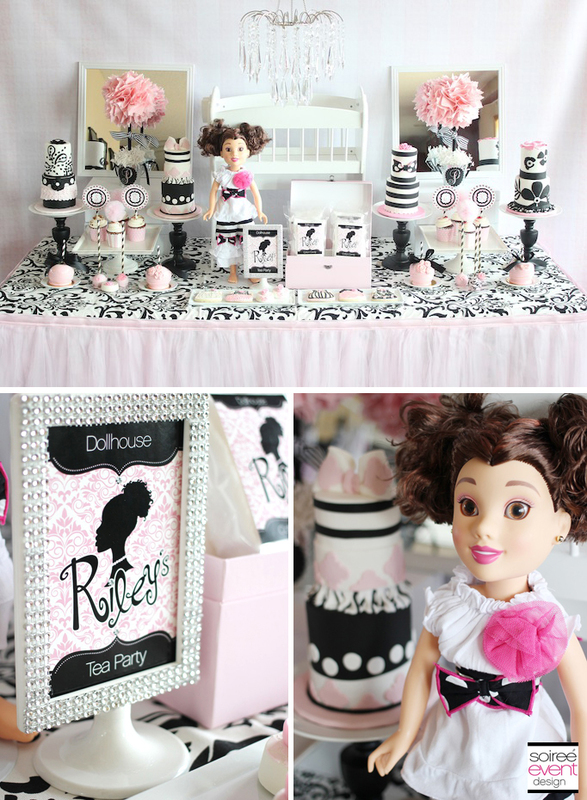 What an amazing doll party! !So many neat details and so much thought put in! I love it. What an amazing tea party indeed. I love how the dolls are dressed like the girls and the cakes as well. I have to share this with my niece for her kids. Thanks for sharing. Wow! Your parties are always so creative and cool! My daughters would love to see a set up like this. What an amazing tea party!! I wish I had fancy parities like that when I was growing up!! I’m almost speechless. That is so gorgeous. My daughter would love something like that. Holy crappola! Talk about pulling out all stops, wow! Well, we couldn’t do this for just any old day but perhaps this is our next bday party go-to plan.